Menus, buffets, cakes - Landgasthof "Zum Mühlenteich"
A great celebration requires an excellent meal. Specialities from the region are just as important a part of our fantastic offer as the love of our kitchen team for the cooking pot. Our team guarantees high quality and freshness of the dishes in the Landgasthof zum Mühlenteich. So that you get a feeling for the manifold possibilities our house offers, we give you here a first impression of the culinary richness of our kitchen. 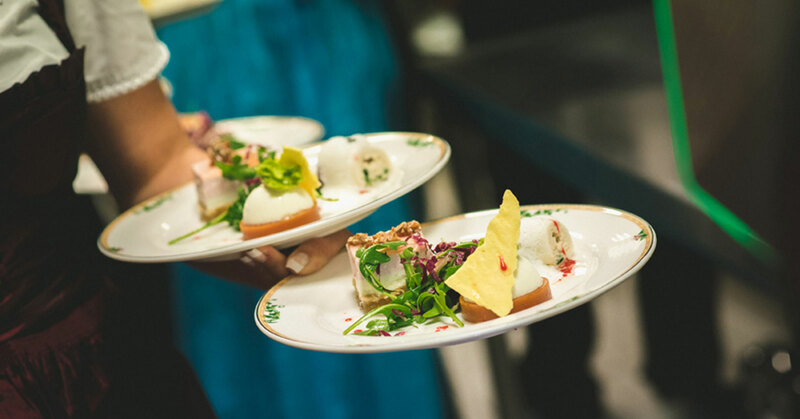 Whether weddings, birthdays, communion or confirmation celebrations – we create the right buffet or menu for every occasion. Each one of them will satisfy both your hosts and your guests. From delicate fruit tartlets to freshly baked cake specialities to delicious strawberry cakes, we have everything you could wish for. Everything comes from our own patisserie and most cakes are still baked today according to old original recipes. Talk to us, we will be happy to arrange an appointment for a detailed arrangement, in which we can also help you with the selection of your wines. Of course we deliver buffet within a radius of 20 km directly to your home. Do you still need personnel, which cooks or serves at your home? Also this is no problem for us. Our trained service staff and our trained chefs will be happy to relieve you of all work.